Since 2011 Susan and Gary Brown have led our Sunday worship services with great joy. Blessed with the talents of multi-instrumentalist and songstress, Susan brings to our worship service an amazing variety of sounds via the fretted dulcimer, guitar, zither, autoharp, piano, penny whistle, recorder, and various rhythm instruments. Gary augments this with his sensitivity for varying vocal harmonies, adding harmonica and creative rhythm instrumentations. 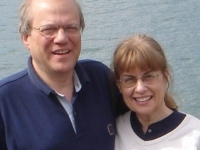 Both Susan and Gary have been involved in church music since their childhood days. Susan has worked as music director/leader, ministering through music for more than 20 years. She combines degrees in theology and music from Valparaiso University to continue that ministry.